Those pesky seatbelt anchors are acting up again. Bentley doesn't make a lot of Mulsannes. So if and when it has to recall them, you know the recall isn't going to be that big. And that's just what's come across our desks today. The British luxury automaker is recalling barely more than a thousand of its flagship sedans in the United States due to a problem with its seatbelts. According to the notice issued by the National Highway Traffic Safety Administration, the issue comes down to the rear seatbelt anchors, which could detach and fail to secure occupants in the event of a crash. The campaign covers certain 2012-18 Mulsannes for a grand total of 1,059 vehicles, all told. It's not clear whether the recall includes the more powerful Mulsanne Speed or the extended-wheelbase version, but it does appear to be limited to those fitted with five– which is, to say, with the rear bench, instead of the optional individual rear buckets, separated by an extended center console (which evidently employs a different type of seatbelt anchor). Dealers are being instructed to fit a reinforced panel to the body structure in order to better secure those troublesome rear seatbelts. 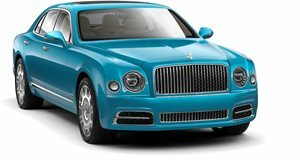 The Mulsanne, for those unfamiliar, is Bentley's flagship limousine and its rival to the Rolls-Royce Phantom. Where its lower-end models are typically powered by smaller, 4.0-liter V8s or 6.0-liter W12s, the Mulsanne packs an old-school 6.75-liter V8 – also twin-turbocharged, producing upwards of 500 horsepower and 750 lb-ft of torque. Bentley typically sells about 100-200 Mulsannes in the United States each year. This compared to the thousand or so Continentals and Bentaygas, and the several hundred Flying Spurs it moves here per annum. So the recall would ostensibly cover the bulk of those units on American roads.